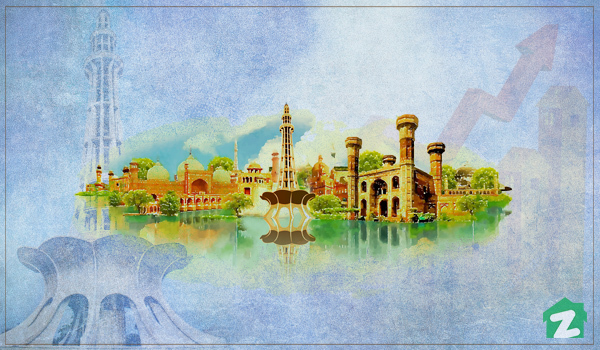 Lahore is one of the most progressive and cosmopolitan cities of Pakistan, and with a population of 11,126,285 (as of Census 2017), the demand for real estate is ever-present here. As such, people often wonder about the city areas that are best for investment – and in a variety of property types. 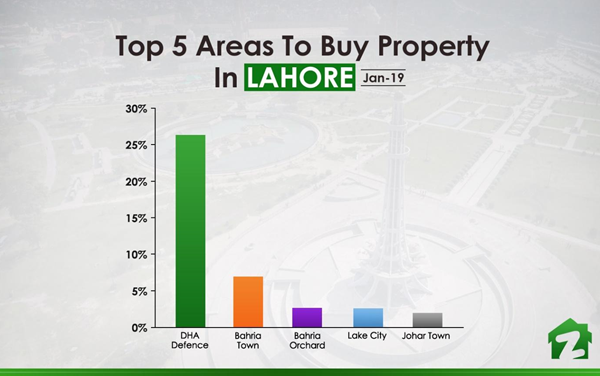 The graph (below) shows the top 5 areas offering property for sale in Lahore. 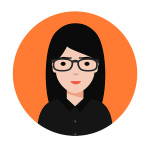 We will now discuss all of these areas in detail to list the types of properties that can be found there – and at what rates. For each locality, we will also highlight the sub-areas which are ranking the highest on Zameen’s total search percentages meter. 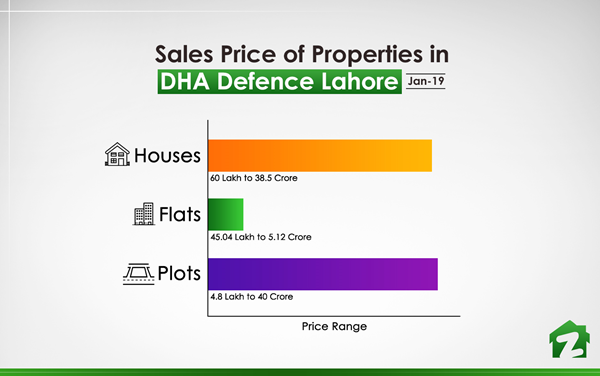 One of the best places to offering property for sale in Lahore, Defence Housing Authority (DHA) garners 26.4% of the total searches made for buying property in Lahore. Phases 6, 8 and 7 are the most popular sub-divisions here, claiming 19.5%, 18.1% and 17.1% of the total searches share respectively. 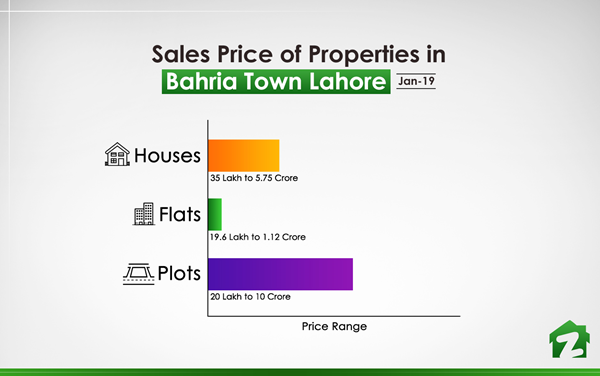 The buying price of a 5 marla house in DHA Defence is between PKR 90 lakh and PKR 2.7 crore, while a 10 marla house can be bought from PKR 1.58 crore to PKR 4.25 crore. A 1 kanal house, on the other hand, is available for purchase at the price of PKR 1.65 to PKR 12.25 crore. DHA Defence Lahore also offers 1, 2 and 3-bedroom apartments for sale, with 1-bed options being sold for PKR 45.04 lakh to PKR 1.69 crore. For buying a 2-bedroom flat in DHA Lahore, investors will have to pay PKR 60 lakh to PKR 3.57 crore while a 3-bed alternative can cost around PKR 1 crore to PKR 5.12 crore. Residential plots for sale in DHA Defence are available for PKR 27 lakh to PKR 2.25 crore for 5 marla, PKR 29.5 lakh to PKR 3.4 crore for 10 marla and PKR 30 lakh to PKR 6.5 crore for 1 kanal. Bahria Town is next among the best places for investment with a 7.1% share in property buying searches for Lahore. Sectors C, E and F are the most searched for areas in Bahria Town, with total search percentages of 25.3%, 18.3% and 17.5% respectively. While 5 marla houses in the locality are priced between PKR 70 lakh and PKR 1.68 crore, the purchasing cost of a 10 marla house can be PKR 98 lakh to PKR 4.75 crore. Moreover, 1 kanal houses in Bahria Town have prices between PKR 2.25 crore and PKR 5.75 crore. Considering buying an apartment in Bahria Town? Well, the options are limited to 1 and 2-bedroom units. A 1-bed flat can cost PKR 19.6 lakh to PKR 65 lakh, whereas a 2-bedroom apartment is available for PKR 45 lakh to PKR 1.12 crore. If you are looking for a residential plot in Bahria Town, it will require an investment of PKR 20 lakh to PKR 1.3 crore for an area size of 5 marla. Meanwhile, investing in a 10 marla plot can cost PKR 27 lakh to PKR 2.4 crore, whereas land of 1 kanal area size can be bought between PKR 52 lakh and PKR 2.8 crore or more. 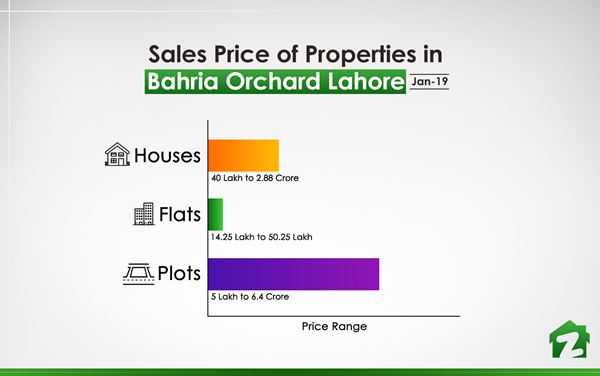 Another residential project by Bahria in Lahore, Bahria Orchard occupies the third position on our list – as trends show that 2.7% of the total searches for property buying in Lahore are focused on this locality. The project’s Phases 1, 2 and 4 are the most famous in property buyer circles, claiming 40.7%, 37.9% and 16.5% (respectively) of the total searches volume. Houses of 5 marla in Bahria Orchard can cost anywhere between PKR 35 lakh and PKR 1.25 crore, while 10 marla homes have prices ranging from PKR 1.35 crore to PKR 2.8 crore. Furthermore, buying a 1 kanal house in Bahria Orchard can be an investment of PKR 1.6 crore to PKR 2.66 crore. Bahria Orchard offers 1 and 2-bedroom apartments for sale. 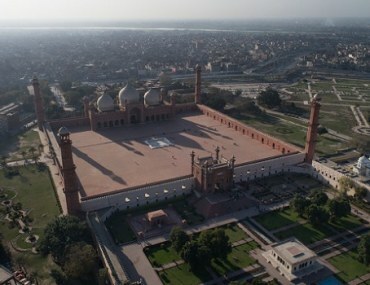 However, the 1-bed options are limited and are priced between PKR 14.25 lakh and PKR 49.96 lakh. The 2-bed units can require an investment of PKR 26 lakh to PKR 50.25 lakh. When it comes to residential plots, Bahria Orchard offers a number of sizes, with the most popular being 5 and 10 marla, as well as 1 kanal plots. In terms of prices, a 5 marla plot in Bahria Orchard can be on sale for PKR 12 lakh to PKR 59 lakh. Larger residential plots of 10 marla and 1 kanal have starting prices of PKR 17 lakh and PKR 50 lakh, going up to PKR 1.05 crore and PKR 1.35 crore, respectively. 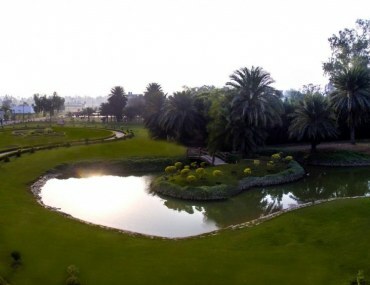 Built on the outskirts of Lahore, Lake City has a total search percentage of 2.6%. The most famous sub-districts are Sectors M-7, M-8 and M-3, having total search percentages of 38.9%, 12.8% and 9.2% respectively. 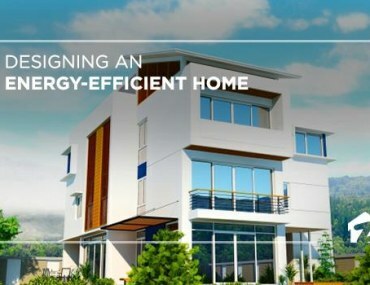 The project offers 5 marla houses for a price of PKR 78 lakh to PKR 1.5 crore, while 10 marla houses for sale in Lake City can be found in the PKR 1.2 crore to PKR 2.5 crore range. Houses having an area size of 1 kanal are available for PKR 2.5 crore to PKR 3.8 crore. 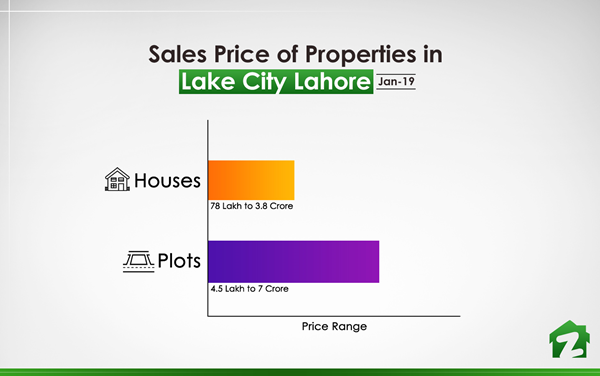 Residential plots in Lake City Lahore are up for sale in a variety of sizes, with land of 5 marla being sold for PKR 20 lakh to PKR 80 lakh. In comparison, residential plots of 10 marla are available for PKR 40 lakh to PKR 7 crore, while 1 kanal plots have prices ranging from PKR 60 lakh to PKR 2.75 crore. Looking at the trends for Lahore’s real estate market, it can be seen that 2.1% of the total searches are based on Johar Town, which is an affluent neighbourhood in Lahore. It only has two major sub-areas which are its Phases 1 and 2. As such, 50.8% of the total searches are for Phase 2, while 48.4% are for Phase 1. Asking prices for 5 marla houses in Johar Town range between PKR 58 lakh to PKR 1.8 crore. A 10 marla home can be bought here for PKR 50 lakh to PKR 3.25 crore, while buying a 1 kanal house can require an investment of PKR 1.05 crore to PKR 12 crore. Apartments for sale in Johar Town are available with 1 or 2 bedrooms. While 1-bedroom units can cost PKR 15 lakh to PKR 35 lakh, a flat having 2 bedrooms can be bought for PKR 24 lakh to PKR 48 lakh. When it comes to buying a residential plot in Johar Town, a 5 marla option is on the market for PKR 44 lakh to PKR 1.9 crore, whereas a 10 marla plot can be purchased for PKR 80 lakh to PKR 2.5 crore. A 1 kanal plot for sale in Johar Town can have a price range of PKR 1.65 to PKR 6 crore. Aside from the top 5 localities mentioned above, the most searched areas to buy property in Lahore also include State Life Housing Society, Wapda Town, LDA Avenue, DHA 11 Rahbar and Lahore Cantonment. SI is a creative soul with a flair for writing. Relaxation for her means seeing the world, reading everything she can get her hands on and spending time with her family. Where do you find a 10 M house of PKR 1.58 crore in DHA Lahore?